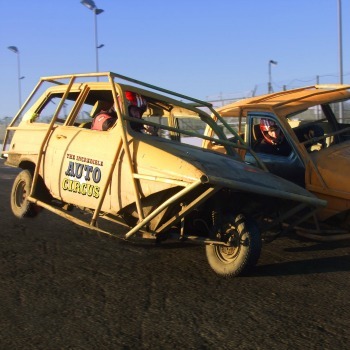 If you love driving and like rallying, supercar days and motor racing, but are looking for a new twist, something a little different, then get a load of these Wacky Racers. Available only at Northampton International Raceway this zany far out four-wheel caper combines the power of the petrol engine with the comfort of furniture to bring you such delights as the 87 mph sofa, the petrol driven office, the double decker car where the driver on top steers and the one underneath operates the pedals, and the motorised bed. Does this sound daft enough for you? Well take our word for it, this rally driving experience with a difference (it’s cars Jim, but not as we know them!! – just loads of motorised furniture) will have you laughing till you split your sides. How much is the Wacky Racers experience? There’s only the one experience on offer, and it’s marketed by different experience providers. All the ones on offer are here in one place for you, and our real time price guide shows you the up to the minute prices from each provider. NOTE: This particular fun experience comes and goes on the market, so it’s not always available. But if it is it’ll appear here first! You may have seen the motorised sofa on Top Gear, in which case you’ll know what to expect. If you’ve not seen it, you sit on a sofa that then is driven off round the racetrack at amazing speeds. Then you get to sit behind the desk in the motorised office, followed by playing the part of upstairs or downstairs driver in the double-decker car which needs both drivers to be in agreement, as one operates the pedals and the other one the steering wheel. Believe us, it’s even more confusing than it sounds. The event that proves the highlight for most people is being tucked up under the duvet of a great big bed and taken on a five mile ride round the local roads, waving to the locals as you pass by. If this won’t get you laughing, we don’t know what will. A word of caution though: don’t expect to drive all the furniture yourself. Driving furniture is an acquired skill so for a lot of the time you’ll be driven by an expert who knows what he’s doing – handling a sofa at speed isn’t something you learn in a few minutes, so left to your own devices you wouldn’t get up much speed at all and the whole day is actually more fun and more enjoyable because you’re safely in the hands of an expert. If you fancy checking out the petrol driven sofa, then have a look at this video where it’s demonstrated by the man who designed and built it, Edd China. If you’re buying for someone who likes cars and has a sense of humour, then this will be their best gift experience ever! For a fun day out, the Wacky Racers takes some beating. Wacky Racers driving experience3.5AdminWacky Racers – ride on a motorised sofa, a petrol-powered office and a turbocharged bed! This gift was purchased for me as a birthday present and I very much enjoyed the experience. I arrived at the Northampton International Raceway full of hope. I had previously been worried that the event may be rained off, due to the UK’s inclement summers of late, and due to the lack of covered vehicles available. I need not have worried, as despite a little drizzle, the event went ahead as planned for the full three hour duration. My partner was also able to view and enjoy a goodie bag and refreshments for a small fee. Some vehicles were able to be driven by us – such as a fun contraption of two cars atop one another.I was in the bottome car and controlled the pedals, another driver in the top car steered very well. Other vehicles were ridden as a passanger, such as the world famous motorised bed. 4 / 4 found this review helpful.